Herodotus of Halicarnassus (in Greek, Ἡρόδοτος Ἁλικαρνᾱσσεύς, Herodotos Halikarnasseus) was a Dorian Greek historian who lived in the 5th century BC (484 BC–ca.425 BC) and is regarded as the "father of history". He is almost exclusively known for writing The Histories, a collection of 'inquiries' (or 'ἱστορίαι', a word which passed into Latin and took on its modern connotation of 'history') about the places and peoples he encountered during his wide-ranging travels around the Mediterranean. The theme for this work was the conflict between the ancient Greeks and the Persians or 'Medes'. Most of what is known of the life of Herodotus has been gleaned from his own work. According to the Byzantine dictionary known as Suda, however, he was exiled from Halicarnassus after his involvement in an unsuccessful coup d'état against the ruling dynasty, and that he then withdrew to the island of Samos. (He seems never to have returned to Halicarnassus, despite the fact that he appears to have been very proud of his native city and of its queen, Artemisia I of Caria). It must have been during his exile that he undertook the journeys he describes in The Histories. These journeys took him to Egypt as far south as the first cataract of the Nile, to the Ukraine, and to Italy and Sicily. Although his description of Babylon contains highly suggestive remarks like "people who have not been there, will find it hard to believe that..." and "this was still the case in my days", he does not claim to have visited the city, and indeed, his description is extremely implausible. Herodotus mentions an interview with an informant in Sparta, and almost certainly he lived for a period in Athens. In Athens, he obviously became familiar with the oral traditions of the prominent families, in particular the Alkmaeonidai, (to which Pericles belonged, on his maternal side). However, as the Athenians did not accept foreigners as citizens, Herodotus must have felt distinctly out of place there. Indeed, when Athens sought citizens for the Italian colony of Thurii in 444 BCE, Herodotus' name was, according to the Suda, among the willing. Whether or not he died in his adopted city is uncertain. At some point, Herodotus became a logios—a reciter of logoi or stories, written in prose. (It is important to emphasize that his work was originally presented orally, and was designed to have an almost theatrical element to it). His subject matter often encompassed battles, other political incidents of note, and, especially, the marvels of foreign lands. He made tours of the Greek cities and the major religious and athletic festivals, where he offered performances and expected payment. In 431 BCE, the Peloponnesian War broke out between Athens and Sparta. It may have been that conflict that inspired him to collect his stories into a continuous narrative. Centering as they do on the theme of Persia's imperial progress, which only a united Athens and Sparta had managed to resist, they may be seen as a critique of, or an attack upon, the war-mongering that threatened to engulf the entire Greek world. Herodotus has passed on to us a large amount of the information concerning part of the world that was current in his own day. Written between 431 BCE and 425 BCE, The Histories were divided by later editors into nine books, named after the nine Muses (the 'Muse of History', Clio, represented the first book). As the work progresses, it becomes apparent that Herodotus is fulfilling his opening desire—to 'prevent the great and wonderful actions of the Greeks and the Barbarians from losing their due meed of glory; and to put on record what causes first brought them into conflict.' Indeed, it is only from this perspective that his opening discussion of ancient wife-stealing is comprehensible: he is attempting to discover who first made the 'west' and the 'east' mutual antagonists, and myth is the only source he can delve into for information on the subject. The first six books deal broadly with the growth of the Persian Empire. The tale begins with an account of the first 'western' monarch to enter into conflict with a 'eastern' people—Croesus of Lydia attacked the Greek city-states of Ionia, and then (misinterpreting a cryptic oracle), also attacked the Persians. (As occurs many times throughout The Histories to those who disregard good advice, Croesus soon lost his kingdom, and nearly his life). Croesus was defeated by Cyrus the Great, founder of the Persian Empire, and Lydia became a Persian province. The second book forms a lengthy digression concerning the history of Egypt, which Cyrus' successor, Cambyses, annexed to the Empire. The following four books deal with the further growth of the Empire under Darius, the Ionian Revolt, and the burning of Sardis (an act participated in by Athens and at least one other Greek polis). The sixth book describes the very first Persian incursion into Greece, an attack upon those who aided the Ionians and a quest for retribution following the attack upon Sardis, which ended with the defeat of the Persians in 490 BC at the battle of Marathon, near Athens. The last three books describe the attempt of the Persian king Xerxes to avenge the Persian defeat at Marathon and to finally absorb Greece into the Empire. The Histories end in the year 479 BCE, with the Persian invaders having suffered both a crushing naval defeat at Salamis, and near utter-annihilation of their ground forces at Plataea. The Persian Empire thus receded to the Aegean coastline of Asia Minor, still threatening but much chastened. It is possible to see the dialectic theme of Persian power and its various excesses running like a 'red thread' throughout the narrative—cause and effect, hubris and fate, vengeance and violence. Even the strange and fantastic tales that are liberally sprinkled throughout the text find their source in this momentum. At every stage, a Persian monarch crosses a body of water or other liminal space and suffers the consequences: Cyrus attacks the Massagetae on the eastern bank of a river, and ends up decapitated; Cambyses attacks the Ethiopians to the south of Egypt, across the desert, and goes mad; Darius attacks the Scythians to the north and is flung back across the Danube; Xerxes lashes and then bridges the Hellespont, and his forces are crushed by the Greeks. Thus, though he strays (and sometimes strays rather far) off of this main course, he always returns to the task at hand—answering the question, how and why did the Greeks and Persians enter into the greatest conflict then known, and what were the consequences? Herodotus' invention has earned him the twin titles The Father of History and The Father of Lies. As these epithets would seem to imply, there has long been a debate—at least from the time of Cicero's 'On the Laws' (Book 1, Chapter 5)—concerning the veracity of his tales, and, more importantly, concerning the extent to which he knew himself to be creating fabrications. Indeed, every manner of argument has surfaced on this subject, from a devious and consciously-fictionalizing Herodotus to a gullible Herodotus whose sources 'saw him coming a long way off'. 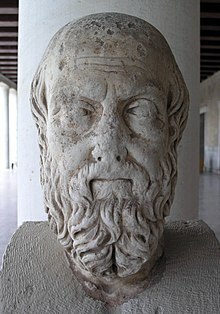 There are many cases in which Herodotus, either uncertain of the truth of an event or unimpressed by the lackluster 'facts' presented to him, reports the several most prominent accounts of a given subject or process and then opines as to which he believes is the most probable. Though The Histories were often criticized in antiquity for bias, inaccuracy and even plagiarism, (for example, Lucian of Samosata attacked Herodotus as a liar in Verae historiae and went so far as to deny him a place among the famous on the Island of the Blessed) this methodology has been seen in a more positive light by many modern historians and philosophers, especially those searching for an example of relatively objective historical writing. Of course, given the sensitivity of the issue, the very founding of the discipline of history, this has not become a consensus view; attacks have been made by several scholars in modern times, a few even arguing that Herodotus exaggerated the extent of his travels and completely fabricated sources—that he made up more than one on a given topic is worse, they seem to say, not better. Discoveries made since the end of the 19th century have helped to rehabilitate Herodotus' reputation a great deal. The archaeological study of the now submerged ancient Egyptian city of Heraklion and the recovery of the so-called 'Naucratis stela' lends substantial credence to Herodotus' previously unsupported claim that Heraklion was founded under the Egyptian New Kingdom. . Because of this recent increase in respect for his accuracy, as well as the quality and content of his observations, Herodotus is now recognized as a pioneer not only in history, but in ethnography and anthropology as well. Readers of Herodotus, however, insulated from the historiographical considerations of academia, are content in the belief that he did the best he could with the material he had. They often point out that his achievement is astonishing, given the massive problems facing anyone attempting to perform historical research in the ancient world and are also quite charmed by the outcome. A. D. Godley, 1920; revised 1926. Reprinted 1931, 1946, 1960, 1966, 1975, 1981, 1990, 1996, 1999, 2004. Available in four volumes from Loeb Classical Library, Harvard University Press. ISBN 0-674-99130-3 Printed with Greek on the left and English on the right. Aubrey de Sélincourt, originally 1954; revised by John Marincola in 1972. Several editions from Penguin Books available. Robin Waterfield, Oxford World's Classics, 1998. Momigliano, A., The Classical Foundations of Modern Historiography. University of California Press, 1992. Romm, James S. Herodotus. New Haven, CT; London: Yale University Press, 1998 (hardcover, ISBN 0300072295; paperback, ISBN 0300072309). Thucydides, ancient Greek historian who is often said to be "the father of history"